Buddy Emmer, left, and Alastair Greene jammed at Tuesday night at Lake Tahoe. Alastair Greene dropped down into Lake Tahoe on Nov. 21 with his Gibson guitar and a box of newly pressed CDs. He didn’t arrive by parachute – that’s just an analogy. Greene had played with Starship in 2014 and he prepared for the Tulsa show in hotel rooms during his tour. Tonight’s show – his third with the Buddy Emmer Blues Band — will be less stressful. A native of Texas, Emmer was influenced by Billy Gibbons of ZZ Top. Greene’s new album features 12 original songs and one cover, Gibbons’ track “Nome Zayne.” An impressive group of artists is featured on Rip Cat Records’ “Dream Train” : Walter Trout, Debbie Davies, Mike Zito, Mike Finnigan and harmonica great Dennis Gruenling. “We are getting a lot of radio play and some good reviews and getting some offers on some stuff for next year,” Greene said. 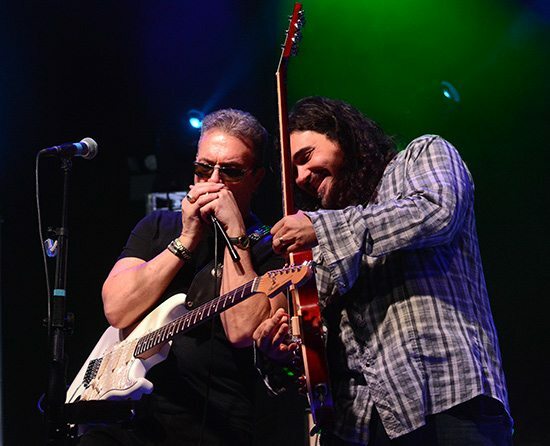 The blues album is Greene’s first since his seven-year run as a rock and roller with the Alan Parsons Project.